The next morning we were still in Fécamp and after enjoying a fancy breakfast we had prepared with fruits, raspberries and mini croissants, pain au chocolats and pain au raisins we headed out to explore the city. This too was a small fishing-town but slightly bigger than Dieppe had been. Like most of the towns by the sea, this too had a lot of boats, especially sailing boats anchored by the promenade. And since it was mother's day here in France on sunday, there was actually quite a lot of people on the streets. Usually even Paris is really dead on a sunday morning, but not this time. 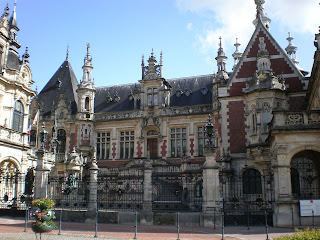 The main sight in Fécamp, apart from the sea and the port, was the Benedictine Palace where they make the liqueur Benedictine. This liqueur is made out of 24 different plants and spices from all around the world according to an old recipe dating from the Renaissance. The building itself has actually never been used by benedictine monks, but was especially built for the museum and the destillery in the 19th century. But it's still magnificent! In the museum they had, among other things, these really old books and documents and it was really amazing (at least for an historian) how they were so well preserved! They almost looked like new ones! 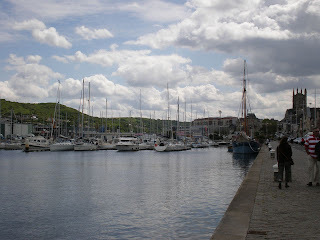 After Fécamp we continued along the coast to our next destination. 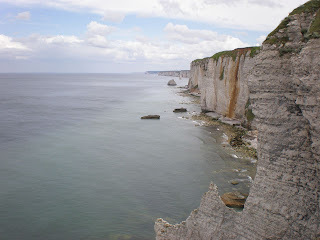 What makes the coast of Normandie so special is the high cliffs throughout the coastline. Aren't they beautiful? They look a lot like the cliffs in Ireland but I guess it's because they once were part of the same piece of land :) Unfortunately the road actually didn't follow the coatline, so we saw the cliffs only when we came to a town or a city. I guess if you'd really like to see them, you'd have to go hiking. Our next destination was a small place called Étretat and famous for its' very special cliffs painted by several artists, including Claude Monet. There were at least three cliffs that had a natural arch like the one you can see in the picture. This one is perhaps the most panited one, but the others were really beautiful too. You were also able to climb up each cliff and the view from up there was splendid! 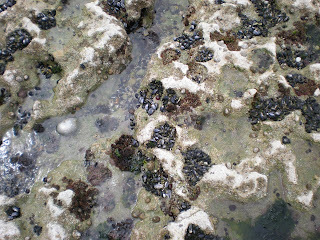 Then, another thrilling thing was that in this area they have the tide-phenomenon. 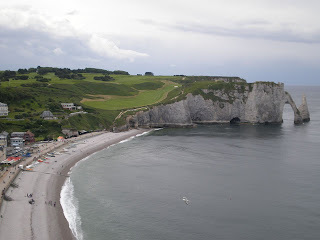 You see that the cliff also has a small cave and when we came to Étretat, the cave was partly under water, but a few hours later, after climbing around on the cliffs, the water had receded so much that you were able to walk to the cave and also enter it. 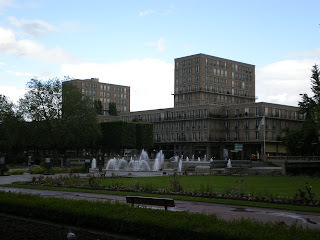 Our last stop before heading back to Paris was the city Le Havre. This city was heavily bombed during the Second World War and therefor lost almost all the old buildings. In stead everything is made out of concrete, espacially built in the 50's, and believe it or not, this concrete city is nowadays listed as a UNESCO world heritage for "an innovative utilization of concrete's potential" and "an exceptional example of architecture and town planning of the post-war era". But it wasn't actually as bad as we had thought after reading that the whole city is just concrete. It was a nice surprise to see how nice they've managed to make it after all! Unfortunately the rain just kept pouring down, so after taking a few pictures of the city center, we decided to drive back to Paris as it already was pretty late. And it was a good thing we started our trip back because there had been a small accident on the highway so we were actually stuck in queues for almost an hour. But, summa sumarum, Normandie is a beautiful part of France for those who like nature and especially the sea. Go there if you ever have the chance!